Producing components with stainless steel is a smart choice for durability and product longevity because of its natural oxide protection layer. However, warping, corrosion, or even metallurgical changes can occur if best practices are not used. Metalworkers new to stainless, or even experienced welders and fabricators in a hurry, need to pay close attention to proper stainless steel handling techniques and procedures to maintain the integrity of the metal and keep the final product in-spec. Find out why introducing surface contaminants is one of the riskiest blunders in handling stainless steel and how to avoid this and other mistakes during stainless steel fabrication. In his article on HAZ, Andrea Bustreo notes the four types of cutting and factors that should be noted in employing them during stainless steel fabrication. Shearing, manual cutting and waterjet cutting do not provoke a HAZ because they do not overheat the sheet metal. Laser cutting generates the smallest HAZ among all thermal cutting techniques because it applies heat on a very small area. Plasma cutting generates an intermediate HAZ because the plasma pulse is wider than a laser beam. Higher currents allow for a higher cutting speed, reducing the duration of exposure and the width of the HAZ. Oxyacetylene cutting generates the widest HAZ of all thermal cutting systems because of the intense heat, slow speed, and wide flames. Intense localized heat from welding can result in the depletion of chromium in the base metal around the weld. This change in the metal makes it sensitive to corrosion. ASM International published a paper listing these options for controlling stainless steel sensitization. A postweld high-temperature anneal and quench to redissolve the chromium at grain boundaries, and hinder chromium carbide formation on cooling. A low-carbon grade of stainless steel (e.g., 304L or 316L) to avoid carbide formation. A stabilized grade of stainless steel containing titanium (alloy 321) or niobium (alloy 327), which preferentially form carbides and leave chromium in solution. 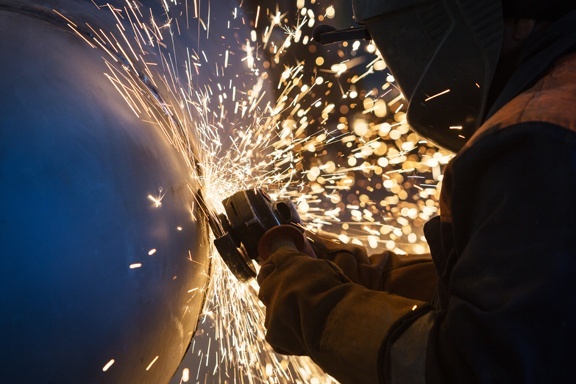 Proper welding and cutting techniques, awareness of the HAZ, and adherence to good quality control and anti-contamination measures will give you an in-spec, well-finished stainless steel product. Make sure that you and your team read this article to keep common stainless steel fabrication mistakes at bay. To learn more about stainless steel fabrication, download your copy of A Metalworker’s Guide to Stainless Steel.